2) I. Adler, M.D., from the Laboratories of the New York Board of Health, told in his paper entitled “Studies on Experimental Atherosclerosis” (4), published in 1913, that a casual remark by Dr. P. A. Levene have suggested the simple procedure of adding dilute hydrochloric acid to the dog's food and thus producing a chronic hyperacidity. This led Adler to include acid-fed dogs in his experiments. He told in his paper that though only two dogs have thus far been fed with hydrochloric acid, presenting sclerotic affections, the possibility can not be denied, especially in view of the numerous negative results with other methods, that these positive results are not mere coincidences, but are probably due to the hydrochloric acid. Referring at the end of his paper about the acid-fed dogs presenting atherosclerotic lesions he stated “that the work is being continued, and definite conclusions would at this stage be premature; but perhaps it may be permitted, even now, to venture the statement that in all probability the theory which bases atherosclerosis on a purely mechanical etiology will not prove tenable. Whether mechanical factors come into play at all, and if so, to what extent, remains to be seen. It seems almost certain, at least in our present state of knowledge, influences, subject possibly to more or less nerve control, are dominant factors in the etiology of atherosclerosis. Perhaps it may be discovered also that cholesterin and its various modifications and combinations, while undoubtedly an element of importance in atherosclerosis of the rabbit and human beings, may not be the sole predominant etiological factor.“. He finished telling that “If it should turn out that so simple a procedure as adding a certain proportion of hydrochloric acid to the food of dogs is sufficient to produce lesions of the blood vessels closely analogous, if not wholly identical with human atherosclerosis, a revision of our present theories will become necessary“. 3. Louis M Warfield, M. D., Third Edition, C. V. Mosby Company, 1920, with full free text at http://www.archive.org/stream/arteriosclerosis00warfuoft/arteriosclerosis00warfuoft_djvu.txt. I am not surprised that lactic acid had those effects in rabbits. Lactic acid is produced as a product of carbohydrate metabolism - and like all other mammals, rabbits do not habitually eat a carbohydrate- rich diet. Their diet of grass and other meadow plants is actually low in carbs and high in fibre. That fibre is fermented in their caecum and colon to produce short-chain fatty acids (acetic, propionic and butyric acids). As far as the rabbit is concerned, its natural diet gives it a fat : protein : carb ratio of around 70 : 20 : 10 %kcals. Just like all other mammals, its natural energy source is mainly from fats. Lactic acid would naturally be very low in both the gut and serum of a rabbit. That should also be the case in dogs - and for that matter, in Homo sapiens. There is a glaring error on this paper which undermines everything else. In the second paragraph on page 2, it states that the dog is omnivorous. Oh, no, it isn't! The dog is NOT an omnivore, it is a carnivore. Forget that and you are likely to incur large vets' bills! Dogs that are fed their natural carnivore diet never suffer the chronic degenerative diseases that dogs fed a 'healthy' cereal and veg based diet suffer. I'm not sure I can find a reference now, but I read a few years ago that only animals which eat plants - herbivores and omnivores - develop atherosclerosis. In which case, if a dog has atherosclerotic lesions, it's likely it has not been fed its natural diet. The experimental and 'normal' diets used in this study are appalling. Page 12 "They fed well on their usual diet of bread and meat, thus showing that the sclerotic affection of the large vessels was in all likelihood due to the acid, and that it was probably immaterial whether the dogs ate meat or not." This is utter nonsense. It's much more likely that the sclerotic affection was a result of eating the bread. It is this kind of study which gave us the 'diet/heart' hypothesis sixty years ago. I share the same opinion from Barry, an independent researcher and excellent writer*, that carbohydrate based diets may cause atherosclerosis, as already discussed in this blog. However, with the due respect, I beg to differ from his hard general opinion on Adler’s study and specifically that the sclerotic affection in the acid-fed dogs was a result of eating bread, assuming the view there was an insufficient duration time of the experiment for an unnatural diet as is the case to develop the sclerotic affections (less than 4 months). So, I do believe that the atherosclerotic lesions were really caused by the acid feeding. * I enjoyed Barry’s book “Trick and Treat”, that I strongly recommend the reading. Carlos, I would agree with you that atherosclerotic lesions are caused by the acid feeding, not high carbohydrate intake. Excessive fructose intake generates lots of lactic acid so it's likely the major culprit in heart disease. However, it has been demonstrated that high fat intake of any sort can also generate atherosclerotic lesions in rats. Here's a quote from Nutrition Against Disease by Roger J. Williams, PhD. "No discussion of heart disease would be complete without mention of the question of saturated fats. It has come to be almost an orthodox position that if one wishes to protect oneself against heart disease, one should avoid eating saturated (animal) fats. While this idea may not be entirely in error, it is misleading in its emphasis. The evidence shows that high fat consumption, when accompanied by plenty of the essential nutrients which all the cells need, does not cause atherosclerosis or heart disease. Rats have been used extensively to study the effects of diet on atherosclerosis. Under ordinary dietary conditions the inclusion of saturated fats in their diet will consistently promote the deposition of cholesterol in their arteries. (50) For 285 days rats were fed a diet containing 61.6 percent animal fat, but highly superior with respect to protein, mineral, and vitamin content, without producing any pathological changes in the aorta or in the heart." Then there's the omega-6 problem which most everyone has ignored thus far. http://theconsciouslife.com/omega-6-friend-or-foe.htm Excessive peanut butter intake over a period of many years almost did me in. I'm still dealing with the aftermath. Carbohydrate diets significantly increase sympathetic nervous system activity, especially in high-glycemic load, being excessive fructose the most dangerous for the health. 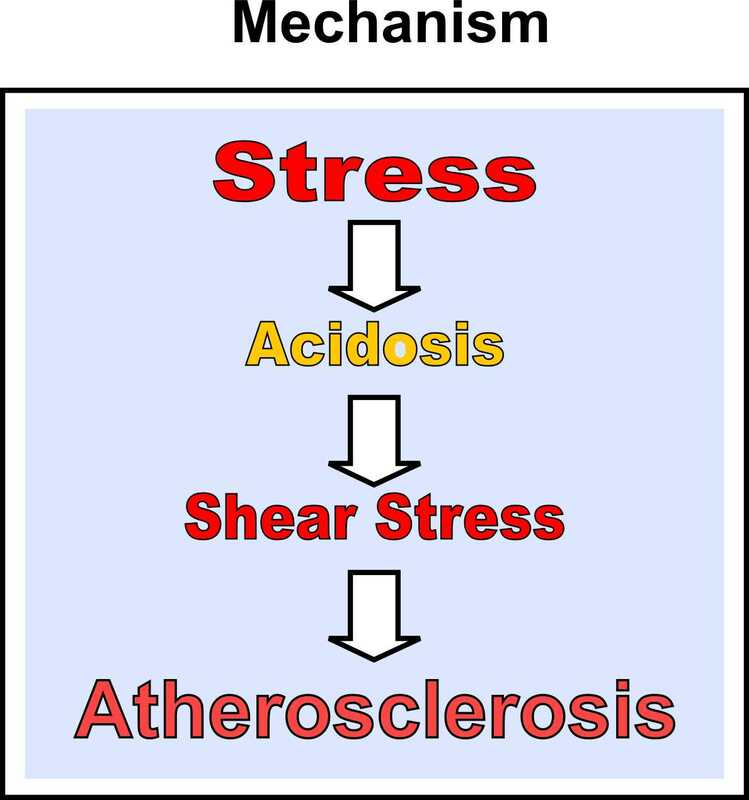 This result in elevated lactic acid that may lead to atherosclerotic lesions, according the sequence of events in the acidity theory of atherosclerosis. Protein or fat ingestion have no significant sympathoexcitatory effect. For references please see in the article “Sympathetic predominance: a primary factor in the cascade of events leading to the atherogenic spiraling“ published in February 22, 2010 in this blog. I think the effect of acid feeding in these experiments were caused not only by a chronic hyperacidity in the rabbits and dogs but also were related to an acute activation of the sympathetic system provoked by the acid ingestion, indirectly raising blood lactic acid.